Download Captain America: Civil War in Digital HD from the iTunes store. Captain America: Civil War images are © Walt Disney Pictures. All Rights Reserved. Everyone is talking about it… #TeamCap or #TeamIronMan. Where do you fall on the spectrum, or do you not even care? If you don't, you should, as Captain America: Civil War seems to be one of 2016's blockbusters. Garnering praise aplenty, movie goers will flock to the theaters to see it at least once in the next month and they won't (or shouldn't) be disappointed. This Marvel movie has a different feel from its predecessors showing a little bit more grit and seriousness than in the past. Don't get me wrong, there are still a few funny moments, but there is also an overall sense that the franchise has matured a little. It seems to be a welcome change, and one that fans should eagerly embrace, as it creates a sense of purpose that the franchise lacked previously. Back are all the major players, and their chemistry is apparent from the beginning. 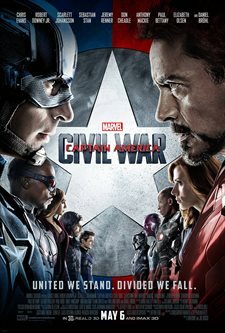 Always at cross purposes, Steve Rogers/Captain America (Chris Evans; Scott Pilgrim vs. the World) and Tony Stark/ Ironman (Robert Downey Jr.; Sherlock Holmes) find themselves on opposing sides of a polarizing argument that invariably splits the Avengers into two camps. While some "go Rogue" with the Captain, others play it safe with the "establishment and Ironman". Joining the well formulated group are a very young and gawkish Peter Parker/Spiderman (Tom Holland; In the Heart of the Sea), the goofball Scott Lang/ Ant-Man (Paul Rudd; The Perks of being a Wallflower) and the agile and stealthy T'CHalla/Black Panther (Chadwick Boseman; Get On Up). While these "newcomers" are a welcome addition, Black Panther's costume leaves a lot to be desired and Spiderman as a super nerdy child is misplaced. It was nice to see Bucky Barnes/Winter Soldier (Sebastian Stan; The Martian) have a more emotional role than he has in past Captain America films, and I hope he will return for future episodes of the franchise. The effects are some of the best I've seen and the fight scene choreography definitely puts all other movies on notice, as it steps up the intricacies a notch. However, the movie is entirely too long and the chase scenes drag on into infinity. There is also a complicated plot that tries to cram too many stories into one movie. Directors Anthony and Joe Russo (Community) give a perspective on the fighting that I found to be all encompassing and thoroughly immerse the viewer in the scenes. I didn't find their camera angles to be skewed, nor the pacing off, but, as stated earlier, the chase scenes should have been further edited in post-production. The other post-production disappointment was the 3-D aspect of the film. It didn't really add anything to the plot or visuals and could have been left out, except the studio can charge more for a 3D showing than a regular one. Hail the almighty dollar (that isn't always a good thing)! Most diehard fans will find enough similarities between the comic books and the movie to feel satisfied that Marvel stayed true to the plot. Those that have never read the comic books but enjoyed the other superhero offerings won't be disappointed by this latest installment. It has action, drama, tension, and, besides a few missteps along the way, hits the proverbial mark for the most part. There are far worse films one could spend their money on and this one will give audiences an escape from reality for over two hours, while including some great fight scenes and special effects. Definitely worth viewing. Captain America: Civil War images © Walt Disney Pictures. All Rights Reserved.